Spinal Decompression Therapy is a leading non-surgical alternative for disc related syndromes of the lumbar and cervical spine. 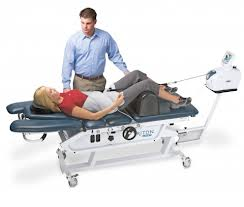 DTS Therapy uses simple, yet sophisticated, FDA registered equipment manufactured by the leading rehabilitation equipment manufacturer in the US, The Chattanooga Group. Chattanooga's Triton DTS (Decompression Traction System) is the most popular decompression system with over 1,200 installations worldwide.